As per an analysis by Housing and Land Rights Network, at least 11.3 million people across India are threatened with the risk of eviction and displacement. State authorities have destroyed over 114 houses every day, evicting about 554 people daily or 23 people every hour in 2018, according to the findings of the Housing and Land Rights Network (HLRN). As per a report released by HLRN, over 41,730 houses have been demolished and at least 2,02,233 people, mainly from the low-income communities, have been forcefully evicted in 2018 across India. On Tuesday, HLRN has released two reports – Forced Evictions in India in 2018: An Unabating National Crisis; and Adjudicating the Human Right to Adequate Housing: Analysis of Important Judgments from Indian High Courts. After analysing data on 218 reported cases of forced eviction in 2018, four broad categories for which people were forcibly evicted and displaced from their homes and habitats were listed – over 94,000 people or 47% of the affected people were evicted in the name of slum-clearance, anti-encroachment or city-beautification drives, over 52,200 people are affected due to infrastructure and ostensible development projects, over 40,600 people were affected due to environmental projects, forest protection, and wildlife conservation and over 15,200 people were evicted citing disaster management. 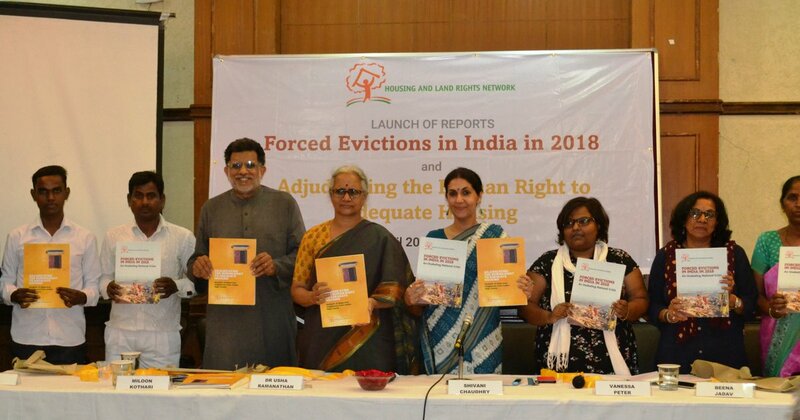 Speaking at the press conference, Shivani Chaudhry of HLRN said that except for CPI(M) and Congress, no other party has included the crucial issue of forced evictions of vulnerable people in their manifestos for the general elections 2019. “At least 11.3 million people across India are threatened with the risk of eviction and displacement,” finds the report.